The fact is that a lot of Canadians do not trust the Conservative Party. This isn't unique to the Conservatives but it is certainly focused on them right now. The 2015 election platform is broken up into numerous small articles that take up several pages of their website. They are laid out well and outline what historically the Conservatives have done and what their plan is to further the initiative in Canada. The focus of most of these plans is on what they are already done with little on what new plans they have for going forward. I will be reviewing the Conservative Party platform for their ideas on environment, energy, transit, food/agriculture, education and economy. 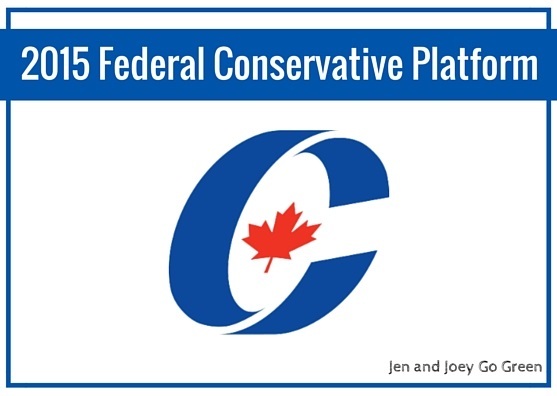 You can find my reviews of the other platforms here - Liberal, Green, NDP. As always the most important thing you can do is to educate yourself on the platforms and get out there and vote. If you have eligible children, speak to them about the issues Canada is facing and encourage them to participate in the Turkey Vote Challenge. Note - due to the way the Conservatives have laid out their Platform I am not convinced that it is all there. I will be checking back every few days to see if more has been added and will update this post accordingly. The Conservative Party is often not known for being a friend of the environment so it is not surprising that their current platform does not focus on this subject. In fact, while they do plan to increase manufacturing and mining in Canada, they have zero plans to tackle the impact of these types of industries on our natural environment. They do discuss conservation but their plans are focused on hunting and fishing. For example - "The modernization of the Migratory Bird regulations will improve the management of hunting for migratory birds in Canada and will remove unnecessary barrier to hunting." Providing $15 million over 3 years to partner with the Pacific Salmon Foundation to restore estuaries in the Lower Mainland and Vancouver Island BC and preserve the lower Harrison River to restore salmon spawning. Complete the establishment of a National Marine Conservation Area Reserve in the Southern Strait of Georgia at a cost of $35 million over 10 years. The Conservative Party has no plans to address clean and renewable energy or energy efficiency in products. The Conservative Party has no plans to support provincial transit plans or issues. The Conservative Party has no plans to preserve or protect our food system outside of their plans for the BC waterways that support salmon populations. Increase the Apprenticeship Job Creation Tax Credit from $2000 to $2500 and extend it to the 3rd and 4th years of training. This will cost an additional $60 million per year. Provide an additional $8 million per year to the Foreign Credential Recognition Loans program to help internationally trained professionals complete the foreign credential recognition process. Enhance the RESP program by doubling the federal grant for low to middle income families. Low income families will see an increase from 20 cents to 40 cents/dollar for the first $500 contributed. Middle income families will see an increase of 10 cents to 20 cents/dollar for the first $500 contributed. The Conservative plan for the economy focuses on tax deductions for businesses and supporting business growth within Canada. Extend and enhance the Mineral Exploration Tax Credit to 25% for 3 years to support mining exploration and investment. Total cost will be $60 million per year. Invest $20 million over 3 years to support the Canadian lobster industry. Pursue free trade agreements to ensure Canadian goods can gain access to new markets. Aid in the expansion of the cruise ship industry in Canada by funding the new maritime terminal at the Port of Montreal (up to $26 million) and funding the expansion of the Ross Gaudreault terminal in Quebec City (up to $26 million). Establish and support ($100 million over 5 years) a new (non-profit) Advanced Manufacturing Hub in Burlington ON to support business development, applied research and technology adoption for manufacturing firms. Establish an Investment and Trade Promotion Office to coordinate federal programs and polices to attract new manufacturing to Canada and to help existing Canadian companies to increase market share globally. Provide $9 million over 3 years to Destination Canada to attract anglers, hunters and snowmobilers from the USA. You can find the Conservative Party platform here. What do you think about the Conservatives plan? Is there anything that you think is missing?